'Westbury House', the John S. Phipps estate designed by George Crawley c. 1905 in Old Westbury. Click HERE for more on 'Westbury House'. Photo from the Ryerson & Burnham Archives at the Art Institute of Chicago. Another great aerial view from the Ryerson and Burnham Archives ! Interesting ~ as it shows not only the tennis courts, but the childrens' swing set in the lower left corner of the view. Are the tennis courts patterned or are they just kinda wet? What a lucky photographer to see these places at the peak of their magnificence. The hidden swing set is a nice family touch amid all the grandeur. Definitely one of the best formal compositions of architecture and landscape design. Always loved this long island mansion. Magnificence done well, something that apparently cannot be accomplished today. The pattern of the tennis courts is similar to the pattern on the great lawn, probably from a recent cutting. The allees that once spread out from this house were astonishing in scope---it is a real pity that the one that extended from the estate (isn't this sort of allee also called a 'ride' in England?) and across the road isn't seen by the town of Westbury (stop laughing Zach!!) as an irreplaceable landscape feature, ah well. At least the garden allee continues as an other-worldly feature, despite the susbaran neighborhood just behind the hedge. Slightly irrelevantly, I visited the Crane estate, 'Castle Hill' in Ipswich on Wednesday. Unlike Westbury House, it was not always lovingly maintained and furnished after going into public ownership, but in recent years, since I was lasst there, there have been many efforts to restore both the landscape and furnish the interiors, and the place is looking splendid. I mention this, because over the last few years, the 1/2 mile allee to the sea that is the great feature of the estate has been completely replanted, looking to the future. I believe it and Westbury are the two finest surviving examples in this country? Thank you! Don't really know how I missed that one. This photo seems to be before the west porch was built.Anyone know when that was added? And what of that building next to the service wing, between the laundry house, does anyone know it's purpose? I wonder if the allee heading north ran into, and continued through Knole? Anon. 7:09 p.m. The extension to the West Porch was put on in 1924; designed by Westbury House architect George Crawley. 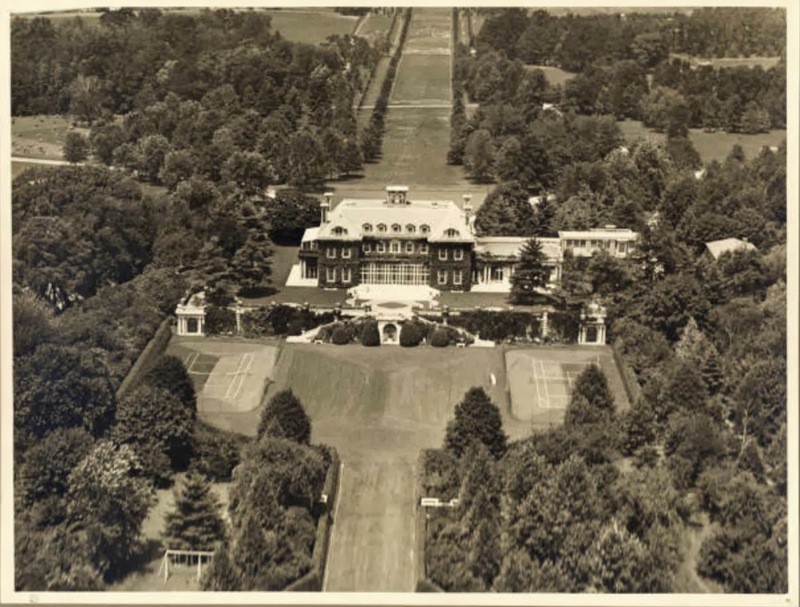 The "building" visible to the right of the ( new ) dining room addition was the 1911 extension/enlargement of the service wing, and was designed by Horace Trumbauer.